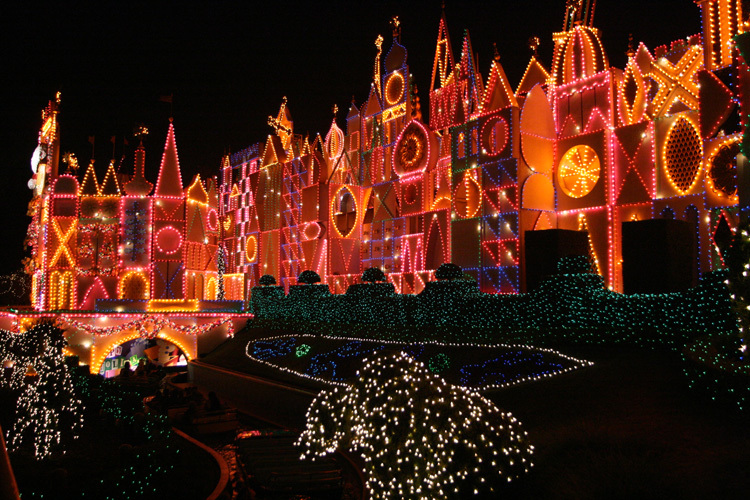 The lawsuit Jose Martinez filed against Disneyland alleging disability discrimination when he was stranded on It’s a Small World grew heated in the last few months. Martinez’ widely publicized lawsuit alleges he and his wife were stranded for 40 minutes on Small World just inside the last tunnel when the attraction malfunctioned. He claims that other, non-disabled guests were removed but that he and his wife (“Buchanan”) were not provided “constructive assistance from any emergency or medical professionals, or Disney employees.” While a female cast member approached their boat, Martinez claims he “felt his blood pressure rising, explained to the female employee that he was having a panic attack, requested medical attention, and insisted that he needed to exit the ride immediately” but without success. Martinez claims that despite telling another employee that he needed medical attention, he remained on Small World, “experiencing Dysreflexia” for another 20 to 25 minutes. Martinez claims he repeatedly requested emergency medical attention but Disney did not contact paramedics until after he exited Small World. When Disney learned Martinez had settled 41 disability discrimination lawsuits, Disney turned up the heat, referring to Martinez as “an admitted professional plaintiff,” and asked the court to compel Martinez disclose what he received to settle them. Disney pointed out that Martinez made allegations in several of the prior lawsuits very similar to the allegations he made against Disney. Ultimately, Martinez dismissed several of his claims, presumably to avoid having to disclose information about his prior settlements. Not long after that the parties resolved the discovery skirmish, they filed motions asking the court to rule in their favor on the merits. The point of these motions is not to have the judge decide who will or should ultimately win, but to have the judge determine whether there are factual disputes that require a hearing. This means the motions finally – over a year and a half after Martinez filed the lawsuit – provide us with Disney’s perspective on the events. The following paragraphs are from Disney’s response to Martinez’ attempt to have the judge grant his motion (a motion I expect he will lose). Disney doesn’t dispute It’s a Small World malfunctioned while Martinez was on it, that Martinez and his wife were unable to exit the ride until it resumed and his boat cycled back to the passenger load/unload dock. While Martinez asserts he was stranded for 40 minutes, Disney’s records show Small World was down for 33 minutes (total) and that Martinez was unloaded from their boat before the end of the official downtime. Martinez began to panic about his situation. The Small World theme song was playing loudly over and over again, despite Martinez and other guests’ repeated requests to turn off the music. Undisputed that the Small World theme song was playing part of the time the ride was stopped, but Disputed that it was playing the entire duration of the downtime. The music was shut off for part of the downtime. I wonder whether Disney’s lawyers might have missed the boat by admitting to this. Martinez visited Disneyland on November 27, 2009. 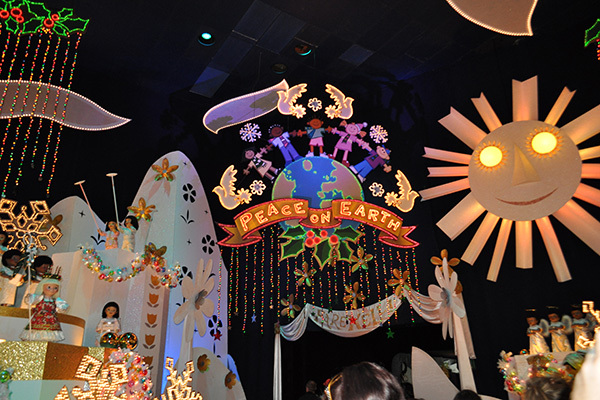 By late November, Small World had the holiday overlay, and that means, unless all the YouTube videos of Small World Holiday are inaccurate, Christmas music would have been playing (though I’m not sure 30 minutes of Deck the Halls would be any less intolerable). Martinez’s anxiety increased as his bladder began to fill and he realized that his anxiety medication and urinary supplies were in his backpack behind him, he believed were unreachable. Plaintiffs had with them at all times they were on the ride a knapsack containing Martinez’s anxiety and blood pressure medication and supplies used to catheterize him. Disputed that Martinez believed the medication and the supplies in the knapsack to be unreachable. They could not determine that it was unreachable because they never tried to reach it or have it reached for them. Specifically, neither Plaintiff ever attempted to reach the knapsack, neither Plaintiff ever told any Disneyland employee that his medication was located in the knapsack on the back of his wheelchair and neither Plaintiff ever asked any Disneyland employee to reach it for them. Buchanan can be heard several times on the videos of the incident asking Martinez if he would like her to attempt to obtain the knapsack, but Martinez never said that she should. Had either Plaintiff asked the Disneyland employees attending to them during the downtime to do so, the knapsack, or the medication from the knapsack, could have been retrieved for them quickly and easily – possibly within three seconds. If Plaintiffs had asked, Tait also could have quickly and easily assisted Buchanan off and around the boat for her to access the knapsack and the medication herself. Disney employee Pam Tait testified that it would not have been safe for Buchanan to attempt to reach Martinez’s backpack behind him. Ms. Tait testified that Buchanan could have reached the knapsack without assistance from Disneyland staff, but it would not have been safe for her to do so. However, Ms. Tait also testified in the very same answer that “all she had to do was ask, and I could have gotten [the medications] for them.” Ms. Tait could have retrieved the knapsack, or the medication from the knapsack, very quickly and easily – possibly within three seconds. Tait did not ask what she could do to help and did not offer to provide any assistance. Tait spoke with both Plaintiffs during the downtime (as she was trained to do and based on standard protocol), inquired as to whether Martinez took medication for the panic attack that he had mentioned, asked if Plaintiffs had water with them (which they said they did), later offered that the fire department could be called to assist Martinez off the boat in an emergency (which neither Plaintiff accepted), asked Martinez if he wanted medical assistance when he made reference to difficulty breathing and, when he responded that he would like medical assistance, she called 911 to report his medical problem, thereby causing the dispatch of Disneyland nurses and City of Anaheim paramedics to his aid. Tait then returned to the WAV [wheelchair-accessible] boat to inform Plaintiffs that help was on the way. The paramedics never came to assess Martinez at Small World. After Tait called 911, Disneyland’s Central Communications Center dispatched both Disneyland nurses and City of Anaheim paramedics to Small World to assist Martinez. Before paramedics had time to arrive, Small World ride operators had already moved Plaintiffs’ WAV boat to the load/unload dock and taken Plaintiffs off the boat, where they were met by two Disneyland nurses. The nurse speaking with Plaintiffs understood that Plaintiffs did not believe the paramedics were necessary, so she called off the paramedics before they had arrived. The nurse understood this in part because Plaintiffs explicitly told her that Martinez did not need paramedics, but only needed to be catheterized. Nurse Geiser was alarmed by Martinez’s blood pressure reading at Small World and knew that Martinez needed to be catheterized immediately to prevent a stroke. Despite her belief that Martinez was in imminent danger, Geiser did not offer to close off the nearby restroom for Martinez and his wife. Instead, she took Martinez through the crowded theme Park to the first aid center at least six minutes away because that was the closest family bathroom. Nurse Geiser explained that Martinez felt he needed to catheterize to stop the trigger of the dysreflexia, and that permitting him to catheterize was the priority so that his then-current status of not having a stroke would not proceed to a potential stroke. For this reason, and because Plaintiffs explicitly told her that paramedics were not required, Geiser believed that calling off the paramedics and getting Martinez to a restroom to catheterize was the priority. Geiser explicitly offered to take Martinez to the Princess Fantasy Faire restrooms, which were less than 100 yards from where she and Plaintiffs were located in front of Small World, so Martinez could be catheterized as quickly as possible. Martinez declined to go to the nearest restroom, and instead chose to go to the family restroom at the First Aid Station. Assuming the court denies Martinez’ motion, and the parties don’t settle, the trial is set to be begin March 13, 2013.